About a month ago, Pawel came home one Sunday morning from tennis with a delicious surprise. Warm cochinita pibil tortas. Cochinita pibil is a traditional Yucatecán pork dish that is marinated in citrus-bitter orange, annato and slow-roasted in a banana leaf. This past Saturday I was taken to the mystery “cochinita pibil torta shop”, Taqueria “El Rincon de los Abuelos” (The Corner of the Grandparents). Only open Saturday’s and Sunday’s, this “secret” has now become one of my favorite food stops in Cozumel. The Saturday and Sunday menu offerings are each different. If you don’t get there early enough items may become sold out and too bad….as the saying “the early bird catches the worm” holds true here. When we walked into this backyard, garden-of-sorts, the first thing I noticed was the lack of estrogen and I felt like I had walked into one of Cozumel’s cantinas or local “watering holes” (a.k.a bar, pub what have you). Except for the hefty, well-rounded Mexican women serving up the days menu hot, each table was loaded with men! This “breakfast boys club” had that nitty-gritty street food feel, a place that Anthony Bourdain might frequent in one his adventures on No Reservations. The wall menu listed the days specials…The grill still sizzled hot from preparing the days offerings early that morning. In the “kitchen”; stained bubbling pots stewed, warm hotel pans were filled with delicious fixens and plastic bowls of marinating chopped pickled onion awaited to be served. We sat down next to a few Policia Municipal. These well decorated, high ranking officials were stuffing their faces with Mondungo…tripe, innards, guts…and dipping slices of day old bread in their bowls, slopping up the broth.They washed it all down with a couple of Cokes each. This stuff is truly what breakfast of champions is made of. 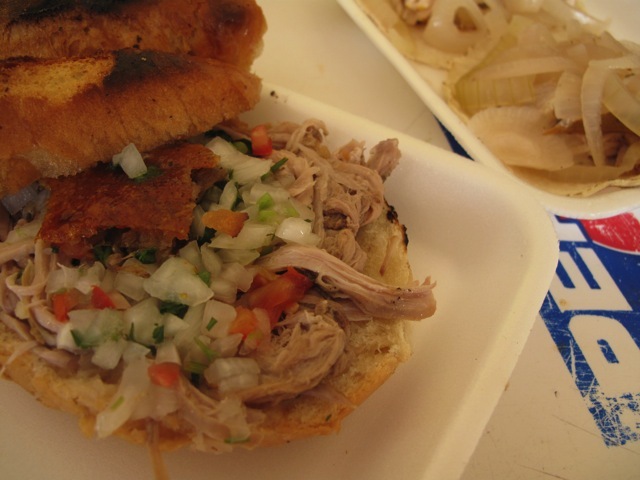 I however, not as daring (as I have had Mondongo in the past, I wasn’t quite ready to eat it for breakfast), instead chose a torta. I indulged in “Lechon al Horno” (a.k.a. pork in its most divine form), oven roasted baby suckling…and “boy” (pun intended, on many levels…young pig and eating with the MEN…sorry I had to) this sandwich was AMAZING! Crusty charred bread, slathered in lard with pulled baby suckling (succulent) pig topped with pickled onions, cilantro, peppers and a tanginess that lingered on your taste buds. To top it off, a piece of crispy pig skin was placed on top of the meat (WARNING: this stuff might be as addicting as crack). Pawel and our new photographer friend Michael Lewis each had two “Tacos de Pavo en Relleno Blanco”…stewed turkey with onions. I have to say though, that my dish was the favorite. You can dine in with the boys or carry-out. I noticed that mostly women were pulling up and bringing food back to their families. Michael took home for his wife two tacos de lechon al horno (my tasty dish but in the taco version). I am still salivating thinking about this place now and in fact I have made another date next Saturday with a foodie friend that will appreciate this kind of place as much as I have. This place will not disappoint. Saturday can’t come soon enough…just have to wish the week away I guess. Hours of Operation: Saturday & Sunday early AM to early afternoon. I’m not telling either. Not even a hint. Is this the place next too Chedraui that always seems to be closed? No it is not. But I would love to join you one Sat. O.k. I’m counting on it! Thanks for the wonderful descriptions, leaving me salivating. After reading your article, I was determined to find it. Bike ride through town…4th day here…I found it! Sneaky sneaky! Happy you found it & enjoyed it. Welcome to the island!